Agency Power Performance Parts for Acura RSX; BMW 335i; Mazda RX-7, RX-8; Mitsubishi Lancer Evolution VII-IX; Nissan 240SX; Porsche 911; Scion tC; Subaru Impreza, WRX, STI. Agency Power Industries LLC was developed out of the need to provide quality, functional, and fashionable racing products. Starting from sway bar endlinks for the Subaru WRX back in 2003, Agency Power now has over 200 part numbers for cars ranging from the STI, EVO, M3, 996, TC, and more. 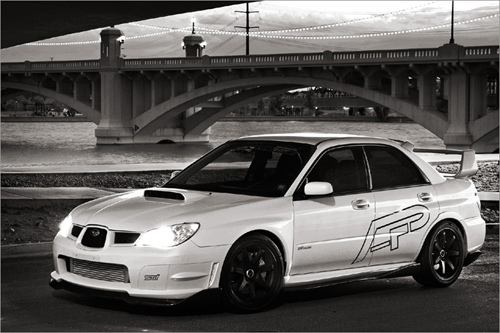 Based out of Chandler, Arizona, Agency Power has established itself as one the core aftermarket companies for Subaru WRX STI and Mitsubishi EVO products. With new focus on the Porsche and BMW market, Agency Power is constantly developing new functional and race proven products. With dealers worldwide, the AP brand is recognized globally. Working with top distributors and tuners in the USA, AP can be found in Singapore, England, Canada, Australia, South Africa, and other parts in the EU. Innovative products like the EVO rear control arms, STI fuel rails, RX8 pulley kit, and 996TT boost hoses, give Agency Power an edge to truly make a difference to your performance vehicle. Agency Power manufacturers 99% of its products here in the USA and does all product testing, racing, and assembly near its Arizona facility. Products like our full titanium muffler catback exhausts, GT35R turbo kits, and adjustable sway bars keep AP at the front of the competition. AP parts have been featured in magazines such as Modified, DSport, Import Tuner, Total 911, Bimmer, and more. Agency Power Dash 06 To Dash 08 Female Swivel Coupler Agency Power Dash 06 Female Swivel Coupler Agency Power Dash 8 JIC Male To 7/8-20, Dual Feed Holly, Short Carburetor Adapter Agency Power Dash 04 Female Swivel Coupler Agency Power Straight Silicone Coupler 2.5"x 3.5"
Copyright © 2007-2015 Boombop Incorporated. All Rights Reserved. Contact the webmaster if you have questions or problems viewing this website.